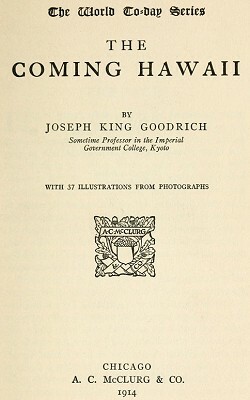 Joseph King Goodrich : Surf Riding in Hawaii, 1914. A. C. McClurg and Co., Chicago, 1914. The quotation from "an Englishman" (Sir Fredrick Treves) is from The Other Side of the Lantern (1905). The World Famed Waikiki Beach, Honolulu. But swimming and surf bathing were the ideal sports in which men and women, boys and girls, young and old took part with the keenest delight. Not only was there ordinary surf-riding, with or without a board, but there were honuhonu, swimming with the hands only, the feet being fast interlocked and motionless — let someone try it who thinks this an easy trick; kula-kalai, wrestling in the sea; lelekawa, leaping from precipices into water, and a hundred other forms of this sport of which the Hawaiians were extravagantly fond. Indeed, they were quite as much at home in the sea as on dry land. Fighting and killing sharks in their native element was, and is, simply sport for the natives. Provided with a sharp knife, and in former times this was only a stone implement, it must be remembered, they would dive into the water and tease the shark in all manner of ways, skilfully evading his jaws, and when they were ready to do so, despatch him with an undercut, or put a stick between his jaws and capture him alive. Territory; and the very broad statement that Honolulu has the most perfect bathing resort in the world is one which is actually borne out by the facts. "One great joy of Honolulu is the sea-bathing, for nothing can surpass it. 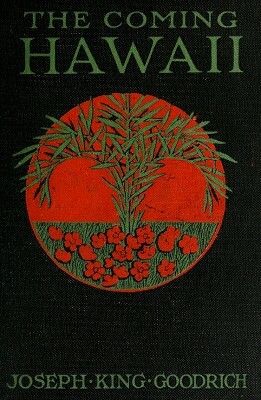 Those who find delight in this rudimentary pursuit must go to the Hawaiian Islands to understand it in perfection. It may be claimed that there is luxurious bathing on the Lido by Venice, or at Atlantic City, or on the coast between Cape Town and Durban. 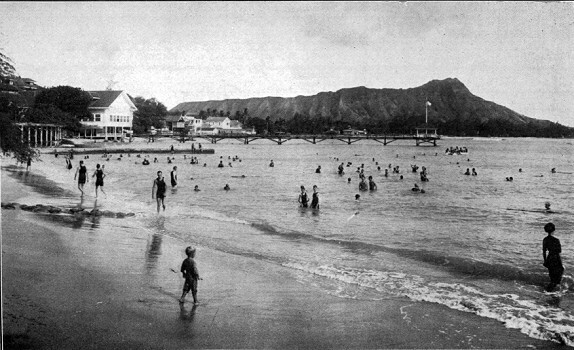 It was of Waikiki Beach that Sir Frederick was speaking, and no one who has seen that place, three miles east of the cityof Honolulu, and reached in a few minutes by electric tram-car, hesitates for a moment in adding his confirmation to the favourable opinion of the thousands of visitors who have been there. When to inspection is added the joy of the actual bathing, enthusiasm comes promptly to add fervour to the endorsement. Waikiki Beach is truly a remarkable place, and it may be stated, parenthetically, that the park, the cocoanut palms, the flowers, and all other scenic attractions make it a charming place of resort. [Footnote]* Sir Frederick Treves, Bart., Sergeant-Surgeon to H. B. M., King Edward VII. those "tigers of the sea" that are plentiful in the water outside the reef, both here and at all parts of the archipelago. Against that firm protecting wall off Waikiki, "the mighty rollers from the sea stub their toes and pitch headlong in foam-crested torrents across the lagoon and on to the white coral sand of the beach"; but there is absolutely no undertow at any time. The water of this lagoon, clean, clear sea brine, scarcely varies from 78° Fahrenheit in temperature the whole year round. Surf-bathing at Waikiki is, therefore, a perennial sport, and the crowd during the late afternoon of a January day is quite as likely as not to be as large as is that of mid-August. Between beach and reef, the bather finds water of any depth to suit his fancy. It is here only that the stranger may witness, if he is not disposed to participate actively in, the remarkable sports of canoeing in the surf and riding the great breakers: the most thrilling, exhilarating, fascinating, health-reviving sports in the world. For both of them, one puts on a bathing-suit, and the conventions at Waikiki permit a certain freedom and comfort in these which are defied at more "proper" beaches. The novice at surf -canoeing will, of course, commit himself to the care of an experienced hand, and take his place in one of the narrow, graceful canoes that are fitted with an outrigger to give them stability. The skilful natives or foreigners will paddle out to the edge of the reef and quickly turn the light craft bow towards the shore before an incoming breaker. slope of its front, sending it shoreward in a cloud of spray at a speed which approximates that of a "limited- express" train, and sometimes, if the comber is rather exceptionally big and enduring, right up onto the sands of the beach. Dexterity is required in this sport; but much more in the surf-board riding and the latter must be the actor's own, gained by personal experience. For this a light, thin, and rather narrow board is required, and it is usually pointed at the front end to make it travel faster than it would otherwise do. The swimmer, and none must attempt surf-board riding who is not a good one, pushes his board out through the breakers, and then lies upon it, facing the shore. He then watches the waves until he sees one coming that is big enough to please him, when he paddles with both hands to get himself going at about the same speed as the breaker is running when it overtakes him. Then, if he has been sufficiently adept, the surge does the rest, carrying him furiously towards the beach, "like a chip in a mill-race." But suppose the would-be rider is not sufficiently adept? Then he and his board are tumbled about most beautifully, and therein is the danger. Those who have acquired somewhat exceptional proficiency can kneel upon their boards, or even stand upright after the ride has fairly begun; but it is needless to say that the beginner does not perform this feat with marked success for some time. Canoe Surf Riding, Waikiki Beach. zest to the fascinating sport. Fascinating it surely must be, for the devotees give hours to it. To see an expert come plunging shoreward on the crest of a big wave that is boiling all about him makes the inexperienced onlooker catch his breath. 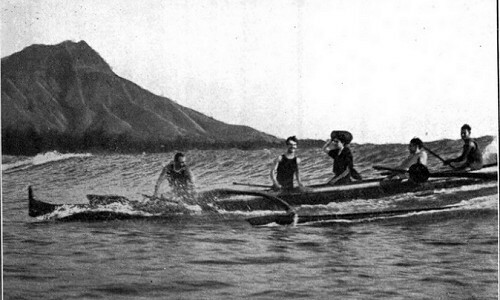 The Hawaiians themselves have practised surf swimming in every form of the sport for ages, and they are all adepts, skill seeming to come to them with their mothers' milk! Yet nowadays the haole — foreigner — boys and girls, men and even a few grown women are pushing the natives hard for first honours; and every day of the year sees a crowd of bathers at Waikiki, most of them trying their hands at surf-canoeing or surfboard riding. But if precedence is justly given to Waikiki Beach as being the ideal place for sea-bathing, that does not mean that good bathing is a monopoly of Honolulu. On Cocoanut Island, the little beauty spot in Hilo Bay, Hawaii Island, there is another beach that is almost as good as Oahu's best. Kauai Island, too, is especially proud of her bathing beaches. Almost every district of this last-mentioned island has its beach which has been famous since prehistoric times. Hanalei, on the north coast, claims one of the best of these, and it offers the added feature of freshwater bathing, in Hanalei River, the largest stream of the territory. This place, from the fact that it has a good hotel, is one of the most popular places in all Hawaii with transient visitors. At a place called Palihili, on the west coast, near the "Barking Sands," is another beach that is famous, especially with the native Hawaiians themselves. "lucky places" in olden times, and even nowadays those people believe that there is special benefit to be had by bathing at Palihili. The sand of the beach, at "Barking Sands," is coarse and becomes filled with air when uncovered; just at the turn of the tide, when the flood begins to make, the incoming water expels the air, causing a peculiar sound which induces the name. But every one of the territory's principal islands, and pretty nearly every coast of them, has its bathing beach which would be called admirable anywhere, and yields precedence merely to the superlative excellence of Waikiki, Cocoanut Island, and Hanalei. Geoff Cater (2013-2017) : Joseph King Goodrich : Surf Riding in Hawaii, 1914.